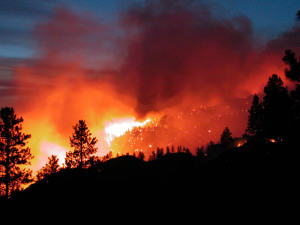 With all of the exciting news about wildfires, I want�to make a pitch in favor of wildfire. Wildfire is part of nature, and it's a good thing. Fire suppression makes natural fires worse when they occur, because kindling builds up on the floor of the forests. Why is wildfire good? Not just because it is "natural." I am not a pagan who believes that whatever is "natural" is good. But�fire is nature's way of creating swaths of ash-fertilized space for plant�succession on the land, and new habitats for the species that like newer growth. In fact, mature forests probably have the lowest biodiversity of any non-polar�habitat. For one example, the Elk and songbird populations of Yellowstone took a huge jump after the big fires. Smokey the Bear was wrong. Wildfire is part of the creative destruction of nature. Suppressing it is�little more than sentimentalism combined with a subsidy to logging business.�Whether millions of taxpayer's money�should be spent, and lives risked and lost, to support that sentimentalism and that industry is a political question (to which my answer is "No"). Had the occasion to drive through there once or twice since--you can clearly tell where the fire was it is by far the lushest and greenest part of the forest. Think of all the CO2!!!!! The new green is handling it nicely. Probably be better if it was a little warmer. Well, the basic chemistry is such that decomposition releases CO2 just as does fire - only more slowly. Oxydation either way. Some of us think that is a Good Thing. There are people who think green stuff is food, others that think green stuff is what food eats. In any case, the system has worked for a Very Long Time. The "carbon cycle" includes the Himalayan Mountains, the rainfall upon which releases CO2 from all that folded ancient seabed shale. What we need to do is seal the Himalayas. A good Spar Varnish would probably do it. In a college wildlife course, my teacher explained the whole benefits of natural fire in an ecosystem thing to us - it was news to me - and very interesting. "Burney the Bear" not Smokey was his hero. Fires are fine, as long as the underbrush has not overgrown. Some forests depend upon periodic fires to keep the underbrush down. Some eco-fascists have prevented clearing or managing the undergrowth. This results in unnatural fires that destroy rather than rejuvenate. I was in a part of Yellowstone several years ago, about 10-15 years after a fire the eco-fascists said to leave alone. It was a blackened moonscape - completely DEAD, nothing grew there, not even near streams. The extreme heat destroyed the soil. There should have been a lot of 15 to 20 foot lodge pole pine; there was none! (It usually grows like weeds in an area like that after a fire.) Fires do have place, but not when the undergrowth has been left to grow unnaturally. Just think of wildfires as the only way to prevent a catastrophic build up of FUEL under the trees. Can't understand why this was such a revelation to the BLM after those Yellowstone fires some years ago put the agency on the hot seat (so to speak). That was my point, Buddy. BTW, I have heard that some redwoods in California may be in trouble because of the buildup of undergrowth (FUEL). Apparently, the redwoods need periodic fires or mechanical clearing of the under growth. This has been stopped (by eco-fascist, or tree-huggers in general), so it has built up, and now future fires could be the end of these redwoods. The deal with the redwoods a I recall is that the seeds will only open under intense heat, so they can't germinate without a fire. I learned that a lot of years ago--there may be more recent word. I have an idea: there are some places in a forest to which we might apply a good compromise. How about controlled burns of the undergrowth from time to time. That way you don't have to destroy the timber, AND you can keep it fuel free and obtain the benefits of fire. Why protect the timber? Compromise with what, Ms. Pie? I don't see any debate yet. Sorry, forgot to mention that it would be a good idea to still maintain some timber standing for harvest and re-seeding (professional growing of trees for lumber production). I believe timber to be one of the commodities that we do need from time to time. There is also the issue of snow pack. Regrowth of high mountain timber does not happen nearly so quickly as it does in lower places such as the Yellowstone fire area. True. And we love ya. But fire is a natural process, and does more good than harm. Economics is not the be all and end all.